Looking for a truly efficient penetrating oil? To find an effective penetrating oil, one would need to dig deep through the popular penetrating oils available in the market. Luckily for you, that's exactly what we have done. A good penetrating oil is the goto solution for maintaining and removing rusty materials and breaking rusted stuck nuts and bolts of machinery. You might have an idea on what oil looks like and what it does, whether it is used as fuel for transportation, or heat for cooking, or for creating specific products like plastics and other materials. Oil can be used as a lubricant to minimize friction. But not all oils can be used as a lubricant to loosen stuck rusted nuts and bolts; it’ll probably do more harm than good. That’s where the penetrating oil for rusted bolts come into play. Penetrating oils have a low viscosity that enables them to seep between cracks and narrow spaces, leaving an oil film inside spaces. With reducing agents and anti-oxidants, the oil film left displaces other stored materials, cleaning the insides to help minimize friction and to be loosened freely without needing excessive force. 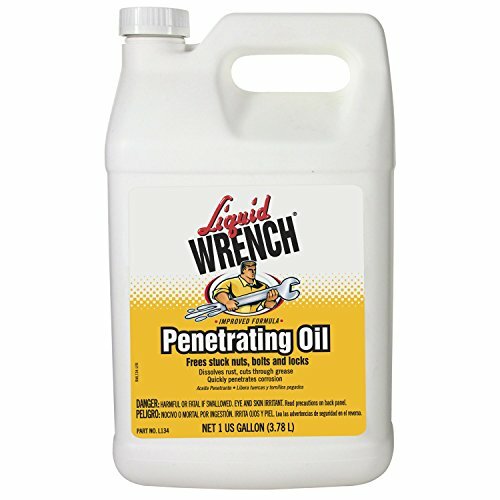 I already know what a Penetrating Oil is. Take me to the Reviews! The primary role of the penetrating fluid is to loosen and break frozen, corroded, or stuck bolts and nuts without the use of excessive force. With its low viscosity, it enables the fluid to move and enter into crevices, pores, and threads of any material that needs to be loosened. When the bolt is totally stuck, and you already tried the good ol' brute force, the best Penetrating Oil is what you need. Most of the penetrating oils are made of polymethacrylate, zinc dialkyldithiophosphate, alkyl succinic acid, tert-dibutyl-p-cresol, lower alKanols, lower alkyl benzenes, and methyl silicone in a stock of paraffin bright stock lube oil. ​While penetrating oils are best known to loosen seized bolts and nuts, they also offer other benefits. While there might be a debate on what is the best rust penetrant, it is known that penetrating oil can be an excellent anti-corrosion and anti-rust substitute. You can use penetrating oil for daily or weekly mechanical material maintenance. You can apply penetrating oil for exhaust bolts, metal joints, spark plugs and other machinery regularly. The reason behind this is its anti-oxidant agents that help prevent rust from accumulating. Wise people say, “Prevention is better than cure”. Why not start using penetrating oil to prevent rust, rather than using it to remove rust in the first place? This way, you can stop materials from corroding and getting rusty, resulting in a more efficient and extended life for your machine. The best Penetrating oil acts as a degreaser or a cleaning solvent, to remove contaminants like greases, tars, and rust. When the product mobilizes, the residue is now easier to remove using a clean cloth, more than just using plain water. Rust can even damage the material. It is the best penetrant for rusted bolts and mechanical parts, with its anti-corrosive ability. It means that it does not only prevent, but also cleans rust. It can even stop the build-up of harmful particles that you may find in dirt and grease which can cause performance inefficiency of machinery. Furthermore, there have been discovered instances where penetrating oil is used, like for quieting noisy hinges and suspensions. Another non-machine-related purpose for penetrating oil is that it removes gum and adhesives that are stuck on the surface. If you want that sticky residue off, penetrating oil can surely get the job done. But use penetrating oil in removing adhesive with caution. With its high volatile chemicals, it can damage certain surfaces and materials. This kind of penetrating oil is fire-resistant. Solid lubricant particles are contained in a synthetic oil. Examples of these solid lubricants are boron nitride, graphite, and polytetrafluoroethylene. This explains the low friction characteristics present in oils. This penetrating oil is primarily used for mechanical purposes. This kind of penetrating liquid is liquid in form, with the oils emulsified in low water concentration. The soluble oil created with high water content is built for fire resistance. On the other hand, straight oil is highly flammable; it is composed of base minerals and often contains polar lubricants such as fats, vegetable oils, and additives such as chlorine, sulfur, and phosphorus. It is used in machining operations in an undiluted form. Penetrating oil Kroil has been considered a “jack-of-all-trades” with its universal capabilities. Kroil gun cleaning has existed for years; it is known as the best friend of gun fanatics, being the number 1 go-to product used in cleaning and maintaining guns. It is also used for other home purposes. Anything that needs to be moved, from wheel bearings, door hinges, to tube bolts, Kano Kroil can handle it fast and easy. The pros in using the product Kano Kroil penetrating oil are its effective and efficient way of penetrating into small cracks and surfaces. It’s said to penetrate into the tiniest surfaces that are as narrow as a millionth of an inch of almost any material; it has been scientifically proven. It dissolves chewing gum without harming the metallic parts. It has been proclaimed to be the best rust penetrating oil with three active ingredients, namely, petroleum-based oil, naphtha, and mineral spirits (Aliphatic Petroleum Distillate). Kano Kroil inevitably gets the job done. In comparing Kano Kroil vs pb blaster, it is accepted that Kano Kroil can loosen products faster than PB blaster and other penetrating and lubricating oils. The cons of Kano Kroil use are that its container shape differs from the other penetrating oil. It will take a while to get used to its shape, and that’s why a lot of people critique it. 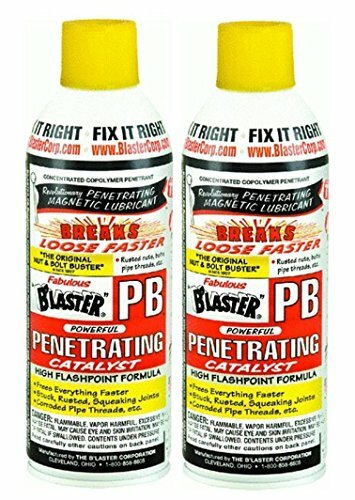 PB blaster penetrating oil has been the consistent number 1 selling penetrating oil in the market since 1957. The pros of using PB blaster are its features of breaking free almost any material. If you need to move something like wheel bearings, door hinges, and many more, PB blaster has it covered. It is considered as the most effective penetrating oil for aluminium, coupled with its affordable price. It also contains a non-evaporating lubricant that saves and protects equipment against further rust and corrosion. One con from the PB blaster reviews is that it generates a lot of fumes. Use it in an open place and wear goggles to prevent the residue from contact with the eyes, which may cause a lot of eye irritations and eye problems. Also, use a mask to avoid chemical inhalation. Another con of PB blaster is that it can’t be used with plastic materials. With the talks about cons of PB blaster, this product is almost perfect; even in the debate between PB blaster vs liquid wrench, PB blaster is far more superior than liquid wrench, with its affordability, consistency and efficient dealing with seized bolts. 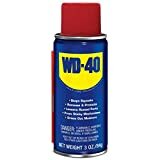 The classic and iconic WD 40 specialist rust release spray has been an incredibly versatile product that every man with a toolbox should not miss. The name WD-40 takes its name from the 40 attempts the inventor had to make to get the water-displacing formula to work. Norman Larsen was the man to take the credit for the creation of the classic WD-40, which has been used since 1953. Since 1993, penetrating oil WD40 has been used in 4 out of 5 American households, and 80% of professionals have been leaning on it ever since. WD-40 has been helping out in household maintenance since the past decades. Its advantages are that it is indeed the universal penetrating and lubricant oil for almost anything. The WD 40 penetrating oil review can be used to protect a bird feeder, separate stuck glassware and stuck ring, remove chewing gum from hair and other surfaces, clean toilet bowls and license plates, remove tea stains, clean guitar strings, loosen zippers, shine winterproof boots and shoes, and degrease your hands; and the list goes on. There are tons of what WD-40 oil can do, and that’s why almost all households have 1 or multiple cans stored inside houses. 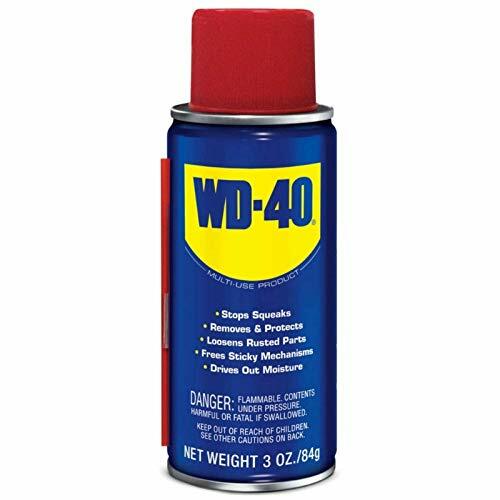 WD 40 penetrating oil sds (safety data sheet) states that WD 40 doesn’t cause bodily harm once the user’s body is exposed to it and the substance inside it doesn’t cause cancer. While WD-40 has been an iconic item in households all over the world, a lot of people have been coming up with myths about where WD-40 can be used and what it can do. Some claim it contains fish oil and some use it to cure arthritis. WD-40 isn’t a top grade penetrating oil and lubricant compared with other products. With old, rusted and stuck nuts and bolts, PB blaster vs WD 40, WD 40 won’t do a better job than PB blaster. If you say “what can I use instead of wd40”, it is better to use products like PB blaster or Liquid Wrench to break up rusted, frozen, and stuck nuts and bolts, and other rusted machinery. The 3-IN-ONE 10038 Multi-Purpose Oil has been available in the market since 1894. It is not considered a penetrating oil, unlike the previously mentioned products. You can use it in many applications, whether it is cleaning, maintaining, and silencing squeaky components such as door hinges, suspension, and wheels. The 3-IN-ONE 10038 Multi-Purpose Oil is useful as an all-around, all-purpose lubricant making it a versatile product for broad range of applications such as maintaining metals, lubricating shears, sharpening yard tools, and cleaning tools like wrenches, and pliers. A con of 3-IN-ONE 10038 Multi-Purpose Oil is that it cannot penetrate frozen, rusted nuts and bolts, unlike how PB blaster and Liquid Wrench easily can. Despite its top-notch cleaning and maintaining ability, it is sad to say that it can’t quite get the job done when it comes to penetrating rust. With its new look, the container of 3-IN-ONE 10038 Multi-Purpose Oil has been transformed from a drip rim metal can into a plastic squeeze bottle. The new bottle design allows the smooth and controlled dispensation of oil with the squeezing of the bottle. Not every change is an improvement; reviews of the product claimed that the old design was working just fine. With the new design of 3-IN-ONE 10038 Multi-Purpose Oil, some customers claimed that the oil leaks onto the hands of the user. Whether you need to free mechanical parts from rust or you need to clean out the residue of adhesive stickers, a penetrating oil is a good material to have in store in your home and garage. Also known as a penetrating fluid, it can be used as an all-purpose lubricant, a cleaner, and a solution to stop corrosion. Most of the time, a penetrating oil is used for the purpose of loosening mechanical parts, such as bolts and nuts, thanks to its capability to get into the thin spaces where the threads of the rusted parts meet. But before we dive into this amazing product, it’s important to note that there are a lot of other types of lubricants out there. Knowing which lube (lubricant) to use on what material is key to having the best results. For instance, one of the most well-known lubes is the WD-40. It has been out in the market and was made available to consumers in San Diego since 1958. WD-40 is also known to be quite the general-purpose lube in the sense that it can easily remove dirt, loosen stubborn and tight materials, and it can also displace moisture. The thing is, though, that not all multi-purpose agents can be used and should be used in a multi-purpose manner. That is when Liquid Wrench comes into the picture. Although WD-40 is popular to most, Liquid Wrench has stood the test of time, 75 years to be exact, proving that their products are all competitive. What’s great about this company is that even though being multi-purpose is both efficient and convenient, it’s also necessary to have a range of other products to deal with specific problems. There’s only one WD-40 formula while there are six different ones from the Liquid Wrench line. The L106 is the toughest and most trusted penetrating oil since 1941. The product itself weighs 8 ounces for a 6-ounce can. It has a fast-acting, anti-seize formula to ensure that you finish your task in a short period of time. The formula is made with 0% VOC (Volatile Organic Compound) which means it’s very safe to use, even on painted surfaces and indoor work. The smell is also very minimal and both the product and formulation are all 100% made in the USA. The Liquid Wrench Penetrating Oil can dissolve rust and slash through grease. It can loosen up nuts, bolts, and locks that got stuck, all in a very accurate and fast manner. It also has a new and improved spray pattern that’s powerful enough to precisely get into those nooks and crannies of hinges, clamps, latches, pipe fittings as well as other frozen mechanisms. So the next time you need the perfect solution to stuck, frozen or rusty problems, know that a can of the Liquid Wrench Penetrating Oil ought to do the job. With the top famous commercial penetrating oil available in the market as earlier mentioned and the active debate on the best and cheapest penetration oil, there are cases when people improvise and discover. A new way of improvising and creating penetrating oil is to use a 50/50 mix of automatic transmission fluid and acetone. Another variety of penetrating lubricant substitute is vegetable oil and acetone, discovered by Drexel University Philadelphia, Pennsylvania engineering students. Both of these improvised penetrating oil is discussed. You might ask, “Does ATF and acetone work?” It has been used for decades by a majority of machinists and motorists, on their cars or in their houses. No one knows who’ll take the credit for the discovery. But one thing is for sure; it does work. It has already been a part of the life of a mechanic and the average Joe. The transmission fluid and acetone mix competes in the search for the most effective penetrating oil for seized bolts. Ex-student and professional machinist, Bud Baker conducted a comparison test and published by Machinist’s Workshop Magazine in the May and June 2007 edition. With the organized subjective test among the top commercially branded penetrating oil products, and with the recording of required torque to remove the frozen nut, The ATF acetone penetrating oil had the number 1 spot, requiring a maximum of 53 pounds of torque to break the nut. Good news for people who have no extra money for experiments, and people in the rural areas where varieties of penetrating and lubricating oil can be expensive and limited to one. The Vegetable oil and acetone mix was discovered by Drexel University Philadelphia, Pennsylvania, engineering students. Comparison tests of WD-40 Multi Use Oil, vegetable oil mixtures, and ATF were facilitated by a professor of engineering in Drexel University, Alex Moseson. Moseson’s students tested the research of Pat Delany, an E4C key member, that the vegetable mixture can be as effective as branded commercial penetrating oil. The test was conducted with vegetable oil mixed with 10% acetone. Acetone is an active ingredient in removing nail polish, and an alternative chemical for paint thinners. For a more efficient effect, more acetone was added at 30%. Just costing one-tenth of the price of WD 40, the comparison tests show the effectiveness of vegetable oil and acetone more than the WD 40 and automatic transmission fluid. This might sound as good news to you, but in reader reviews, some people proclaim the consistency of WD 40 as a penetrating oil, thus, claiming vegetable oil and acetone mix, as an ineffective penetrating oil for rusted stuck bolts. A comparative experiment was conducted by Machinist’s Workshop Magazine, May to June 2007 edition, on the top commercially branded penetrating oil and the 50/50 mix of automatic transmission fluid and acetone commonly called atf mix. 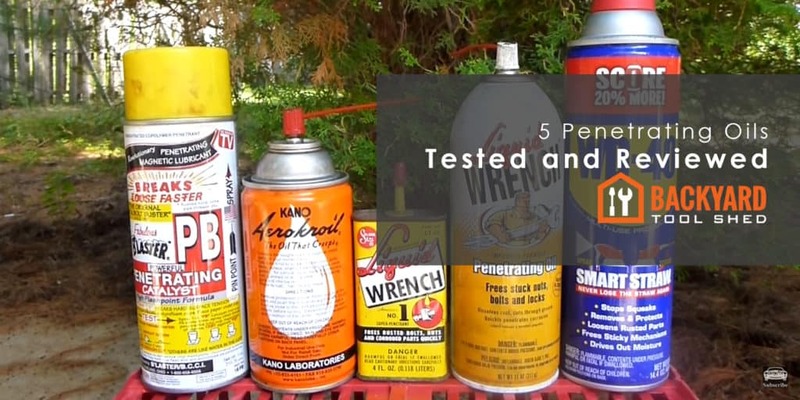 With a measured torque meter, the commercially branded products namely, WD-40 Multi Use, PB Blaster, Liquid Wrench, Kano Kroil and acetone and transmission fluid penetrating oil were put to the test. The torques required to remove the nut from the scientifically rusted bolt were measured. The result and ranks are as follows: No penetrating oil added = 516 foot pounds of torque; 5. WD 40 = 238 foot pounds of torque; 4. PB Blaster = 238 foot pounds of torque; 3. Liquid Wrench = 127 foot pounds of torque; and 2. Kano Kroil = 106 foot of pounds of torque. The number 1 rank was 50/50 blend of ATF and Acetone mix = 50 foot of pounds of torque. The results made 50/50 blend of ATF and acetone mix the superior winner, and it is concluded that ATF acetone for rusted bolts can inevitably get the job done, although they were scientifically rusted. The different commercially branded penetrating oil and home-made improvised penetrating oil were ranked according to their effectiveness and price. The products were scored through the customer reviews on the internet and with the conducted comparison experiments. Regarding the effectiveness as a penetrating oil, the ranks were as follows: 1. 50/50 blend of automatic transmission fluid and acetone mix, 2. PB Blaster, 3. Liquid Wrench, 4. Kano Kroil, 5. 3-IN-ONE 10038 Multi-Purpose Oil, and finally 6. WD 40 Multi Use Oil. Regarding the effectiveness as lubricating oil, the ranks are shown: 1. Kano Kroil, 2. PB Blaster 3. Liquid Wrench, 4. WD 40 Multi Use Oil, 5. 3-IN-ONE 10038 Multi-Purpose Oil. Some products were not included in the comparison because they were not considered to do be able to do the job and they lack tests of effectiveness; an example of this is the vegetable oil and acetone mix. When the debate is all about the best penetrating oil, it all comes to its effectiveness, versatility, and price. 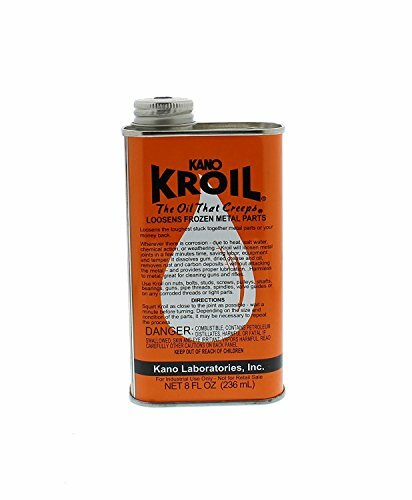 A product wherein the pros outweigh the cons is accepted to efficiently get the job done.The product that ranks the most effective regarding effectiveness as a penetrating oil, versatility, and affordability is the Kano Kroil Penetrating Oil 8 oz. With its perfected scientific formula Kano Kroil Penetrating Oil can penetrate and creep into the smallest spaces down to a million inch of spaces. Perfect for cleaning and maintaining almost every metal from guns to bearings to hinges, Kano Kroil gets it done fast and efficient, making your every penny worth the price. In the debate upon which product that is the most effective penetrating oil, it doesn’t just come with its price or how it claims to be the best. It should be able to back itself up with the positive reviews from customers. Kano Kroil Penetrating Oil 8 oz is, undoubtedly, the best penetrating oil out in the market, this thanks to its consistency regarding effectiveness, versatility, and affordability.